Quaternary stratigraphy of the central Arctic Ocean. One of the biggest problems that obscures our understanding of the Arctic paleoceanography in the context of global climatic change is the lack of reliable chronostratigraphy for Arctic Ocean sediments. Together with a group of collaborators I am dedicated to resolve this problem using new sedimentary records recovered in the HOTRAX 2005 and LOMROG 2007 expeditions. 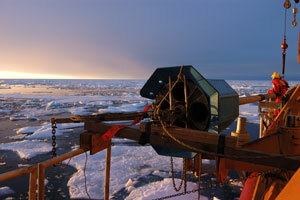 Paleoceanography of the Arctic Ocean and marginal arctic seas. How did the Quaternary changes in sea level, riverine discharge, Atlantic and Pacific water inputs, and glacial build-ups and decays affect the Arctic marine system? What were the Arctic-Atlantic and Arctic-Pacific oceanic interactions on a sub-millennial time scale? Were there periods, since the establishment of the Arctic sea-ice cover, when it was significantly reduced? Glaciation history of the Arctic. There are still many gaps in our knowledge of the timing and extent of large Pleistocene glaciations in the Arctic. Especially weekly understood is the history of glacier ice masses in the Arctic Ocean where they probably formed extensive ice shelves. The specific questions I address to resolve these problems are: What were the limits of the last and penultimate glaciation on the Eurasian arctic shelf? What was the timing and extent of ice shelves in the Arctic Ocean and whether they ever formed a Pan-Arctic Ice Shelf? Modern Arctic marine environments. How do the ongoing climatic change and human-made contaminants affect the sedimentary and biotic environments in the Arctic seas? 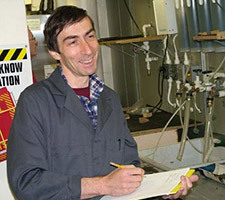 In my work on these research problems I participated in a number of projects and expeditions including the SCICEX geophysical investigation of the Arctic Ocean floor, the Trans-Arctic expedition HOTRAX 2005, and the LOMROG 2007 (LOMonosov Ridge Off Greenland). 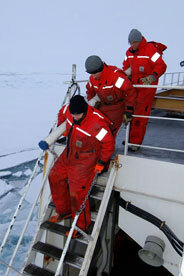 These activities involve collaboration with a number of research groups from USA, Russia, Canada, Norway, and Sweden. My lab work is focused on analyzing sediment cores and interpreting seismic-reflection and sidescan seafloor images. This work is facilitated by the BPRC sediment core repository, which I curate. Page last updated on Mon Jan 12 2009.